André Brasseur has many hit singles up his sleeve, one of the most popular ones being 'Revolution 2000'. Time for a reboot! André and his band put themselves to work in the studio. 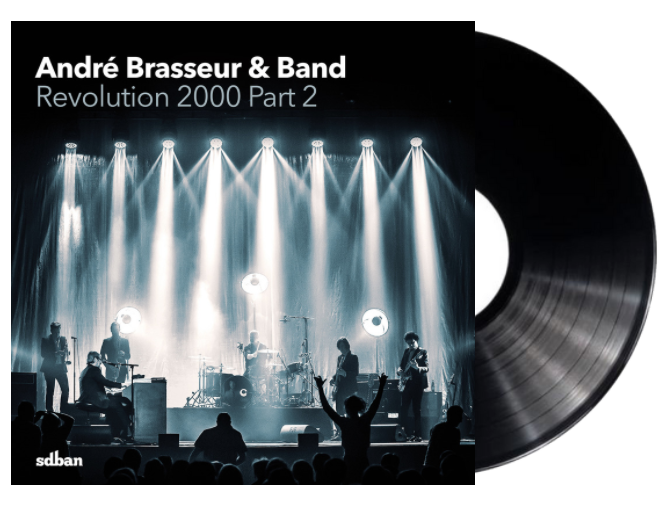 As a result we can present you a fresh new recording of Revolution 2000. An all-time classic, completely repackaged and renewed. A must have for any collector! The limited edition 7-inch (300 pcs.) is exclusively available in the webshop and in the merch stand at out theater shows! It's clear that André Brasseur is ready to enchant a whole new generation. He’s been successfully touring with his band with an absolute high point at Pukkelpop 2016, where he turned the Dance Hall into one enormous matinée-party. He was honoured at the Red Bull Elektropedia Awards where he’s the recipient of the first Vinyl Frontier Lifetime Achievement Award. Now he’s putting his signature twist on another kind of classic. Studio Brussel asked the man to bring a live rendition of the number one of their dance classics hitlist ‘The Greatest Switch’: Push – Universal Nation. The result is so stunning that it since has been re-recorded and mixed for the world to enjoy! You may have never heard of him, but unless you’re a complete stranger to the 20th century, you will almost certainly have heard at least some of his music. André Brasseur composed countless tunes that received plenty of airplay and were used as radio and TV intro tunes all over Europe in the late Sixties and in the Seventies. His biggest hit, ‘Early Bird Satellite’ was an international million seller. The second disc of this compilation features some of Brasseur’s most successful evergreens and hit singles. The first part of the compilation focuses on a lesser known aspect of Brasseur’s musical output. Because in between his quest for the perfect intro tune, playing innumerable live shows and running several successful restaurants and discothèques, Brasseur recorded a great deal of experimental, funky jams in the Seventies. We made it our mission to compile the most exciting and timeless of these lost cuts and ended up with 13 enchanting cult classics and hidden gems, ready to devour.